This strapless lace wedding dress has a simple design. Most brides who prefer simple wedding dresses, mostly use them for anniversaries. This is because many first-timers prefer sophisticated gowns. 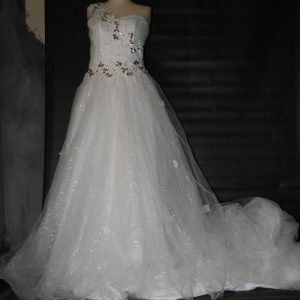 Well, this wedding dress although simple looks stunning and can also be used by a fresh bride. The dress is white and ivory in color but the overall solid color is ivory. It is a strapless dress. Has a crystal beading slightly below the bust. Some flower embroidery throughout the dress and also on the floor. The bridesmaids can probably wear any style depending on the theme. The flower girls likewise. The groom also. Since a crystal styling is present on the bodice, a tiara is required to make this look smoother. If the tiara is out of reach, a great hairpiece will cover. As usual, stunning makeup is necessary. You can do the makeup yourself or hire a professional artist. The bridesmaids can also have a tiara to make the theme more interesting. The lead flower girl can follow suit. A long or short bridal veil will be fine. Here is a fun fact; most lace dresses are not the most beautiful. But they are the most searched dresses. Not interesting? alright, view more wedding gowns. Also, follow us on Facebook for the latest design updates. Finally, in my opinion, I think the lace wedding dress is ideal for weddings with both fewer or many guests. Another thing is that a lace wedding dress tends to tear and wear quickly if dry cleaned regularly. So if you are a fan of lace wedding dresses, you might find the rental stock minimal on most bridal shops.